The summertime brings a change in palette. In the chillier months people crave cinnamon and spices, but the sunnier months call for fruits and Popsicle-like flavors. That’s why Glossier’s new Mango Balm Dotcom is being released right on time, helping you herald in the end of slushie sidewalks and wind-chapped lips. The Balm Dotcom is an Instagram-favorite, do-it-all skin salve. While it might be a great lip balm, the salve also works great for hydrating cuticles, spot treating dry patches, and even acting as a natural looking highlighter for your cheeks. Packed with antioxidants and natural emollients, the balm repairs dry, chafed skin. The salve comes out waxy and thick, which helps the formula stay in place to seal in moisture. Before the newest Mango release, the Balm Dotcom came in six different flavors. There was the original balm — appropriately named Original — which was scentless and came on clear. After that came the Birthday flavor, which was inspired by Milk Bar’s famous funfetti cake. Specifically, the balm smelled like the cake "at a surprise party with rainbow confetti;" the one that has "the corner piece with the most frosting." The balm was packed with subtle shimmer to mimic the sprinkles. After that Rose was released, which came with a barely-there pink tint. To add more color, there was a Cherry flavor that packed a sheer but juicy red tint. Soon after, lip-smacking delicious flavors were released, like Mint, Coconut, and now Mango. Clocking in at an affordable $12, the Mango salve smells like "a tropical escape: freshly sliced mango, a perfectly sunny day, and no plans yet," according to Glossier. 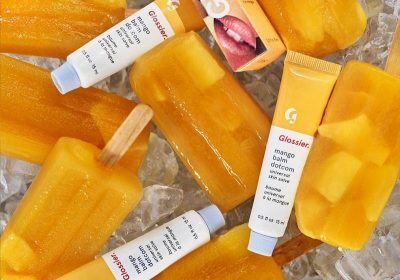 Glossier’s flavor experts drew inspiration for the balm from perfectly-in-season, freshly cut mangoes from a fruit stand to directly bring that authentic fruit experience to you. Some super-power ingredients in the balm are castor seed oil, cupuacu fruit extract, and rice bran and rosemary leaf extracts. Castor seed oil is a natural plant extract, where the thick oil has water-binding properties that keep the skin’s moisture locked in. Cupuacu fruit extract acts like a moisturizer that is packed with skin-loving Omega-6 and Omega-9 fatty acids. The rice bran and rosemary leaf extracts are packed with antioxidants that protect your skin from environmental damage. The salve is hypoallergenic, paraben free, and cruelty free. According to Glossier, to use it you can swipe it onto your lips for a boost in hydration and sheen. Or if you need an instant mood lift, just uncap the tube and breathe deeply. You will instantly be on the beach, with your toes in the sand, and a mango margarita in your hand. Bliss. While it might seem like a simple enough product, people scramble to own Glossier’s skin care items. Case in point: the company is now valued at $1 billion. Well, $1.2 billion to be exact, according to The Wall Street Journal. From Cloud Paint to a balm that tastes like mangoes, Glossier knows what its customers are craving.